The parallax angle is the angle between the Earth at one time of year, and the Earth six months later, as measured from a nearby star. Astronomers use this angle to find the distance from the Earth to that star. How do scientists measure this angle, and how does this information tell them the distance to the star? The Earth revolves around the Sun every year, so that every half year (six months) it is on the opposite side of the sun from where it was six months ago. Because of this, nearby stars will seem to move relative to distant, "background" stars. You can see this effect driving in the country. Nearby road signs seem to move by quickly, but distant buildings/trees/etc. seem to move slowly, and the sun doesn't move at all! (Well, it wouldn't if the Earth weren't rotating.) Another illustration: Hold a pencil at arm's length and look at it through one eye, then the other. Notice how it shifts position, yet it hasn't actually moved. Your eyes model the different positions the Earth is in, first on one side of the Sun (your nose), then the other. Astronomers look at the sky on a specific date, and then six months later, to see how far a nearby star appears to move relative to the background. 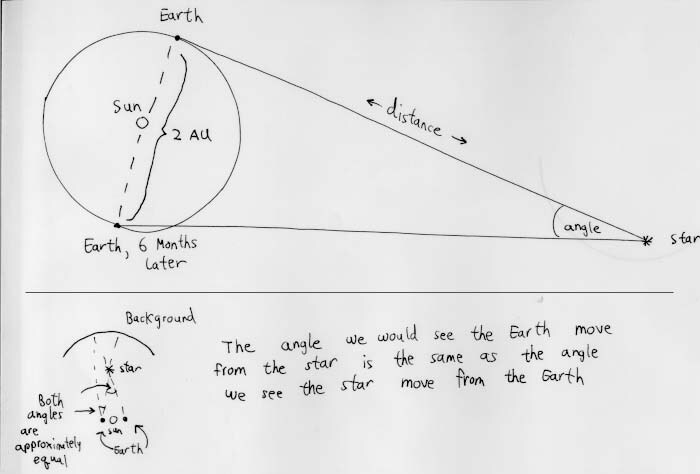 The angle these astronomers measure the star to move is actually the same angle they would see the Earth move if they could travel to the star. Because the scientists know the distance the Earth has traveled in six months (twice the distance to the Sun), they have all the information they need to find the distance to the star. To do this, the astronomers use a method similar to the one you used with your homemade quadrant. Twice the distance to the Sun, divided by the distance to the star (which is unknown so far) is equal to the tangent of the parallax angle of the star.